In this part you are going to analyse original data from the ATLAS experiment that was taken in 2011 in order to draw your own conclusion about the structure of the proton as well as understand how the search for the Higgs particle works. An event display program: MINERVA – Download starts here. 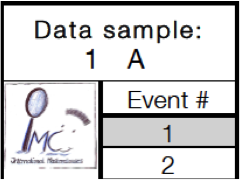 A data sample – All in all there are 12000 events. You will only analyze a subsample of 50 events. The 240 subsamples are labeled as follows: 1A, 1B, ..., 1T, 2A, ..., 2T, ..., 12A, ..., 12T. A tally sheet (PDF) to count your events. In the upper left corner your subsample is defined. You are almost ready to start. On the next two pages, you will find the tasks for the measurement. Have fun!